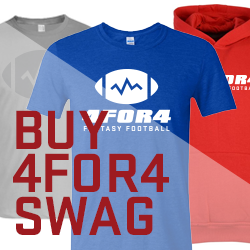 Chris Raybon is the Senior Daily Fantasy Editor at 4for4 Fantasy Football. Follow Chris Raybon on Twitter: @ChrisRaybon. I admittedly don't have much confidence in [his] rushing ability, as he's managed only a 3.3 per-carry average on 87 career totes. However, his projected volume, receiving game and red zone involvement, and the fact his team is a favorite all fit the profile of a strong RB play. In case you didn't realize, I was talking about Devonta Freeman, and if you were a member of that 93.3 percent, your secret is safe with me. I was obviously wrong not to have confidence in Freeman as a runner, but the larger point is that I still based my decision of whether or not to use him in DFS on the correct factors. After reading this article, you'll understand why Freeman would have been a strong play even if he didn't go off that day. I’ll show you the makeup of a valuable DFS running back, how to identify the top values every week and how to tailor your approach at the position to whether you're playing in a cash game or a tournament. Many a football analyst has at one time or another succumbed to the perils of overanalyzing yards per carry, a metric which explains past efficiency but offers little predictive value. In fact, it takes nearly 2,000 carries for a running back's yards per carry to stabilize. Below are the correlations between each running back stat and fantasy production. Pay special attention to the bottom five on each list. Opportunity drives a running back's fantasy productivity far more than per-play efficiency does. Of course, you want the backs you select to be efficient as well, and all things being equal, you'd take the more efficient back, but volume should take precedence. The importance of touches isn't surprising considering yardage accounts for roughly 75 percent of the average running back's fantasy production. Your best bet is to count on yardage steadily accruing via an ample supply of touches, rather than through unpredictable chunk plays; runs of 20 or more yards happened just 0.62 times per team, per week, in 2015. Since 2013, 8.6 running backs per week have scored at least 20 DraftKings points, and 75 percent of them had at least 18 touches. In 2015, 4for4 had a running back projected for at least 18 touches at a DraftKings salary of $4,500 or below 43 times, or 2.5 times per week. Those backs averaged 14.5 points and returned a stellar 3.57 points per $1,000. You have to nail these situations when they arise. Also in 2015, 4for4 had a running back projected for at least 18 touches at a FanDuel salary of $6,500 or below 63 times, or 3.7 per week. Those backs averaged 14.5 points per game -- the same amount as the $8,000-plus backs that we had projected for 18 or more touches collectively averaged. The cheaper backs scored 40 percent more points per dollar. The 18-touch mark (arbitrary as it may be), also provided a reliable floor: running backs who received 18 or more touches scored 10 or more DraftKings points at an 85 percent rate in 2015. As a starting point for finding value at running back, you can simply identify which backs in a given week have the most projected touches per dollar. In contrast to touches, there's no such thing as a touchdown floor for running backs: only seven scored a touchdown in even half of their games in 2015. With few exceptions, a goose egg in the touchdown column is the most likely box score outcome for a running back. Fifty-nine percent of all rushing touchdowns occurred inside the 5-yard line in 2015, and 86 percent occurred inside the red zone. Outside the red zone, the odds are less than one percent that a rushing attempt will go for a touchdown. Put another way, a carry outside the red zone is worth 0.47 fantasy points, but that figure jumps to nearly three times as much in the red zone (1.24), and over five times as much inside the 5-yard line (2.41). 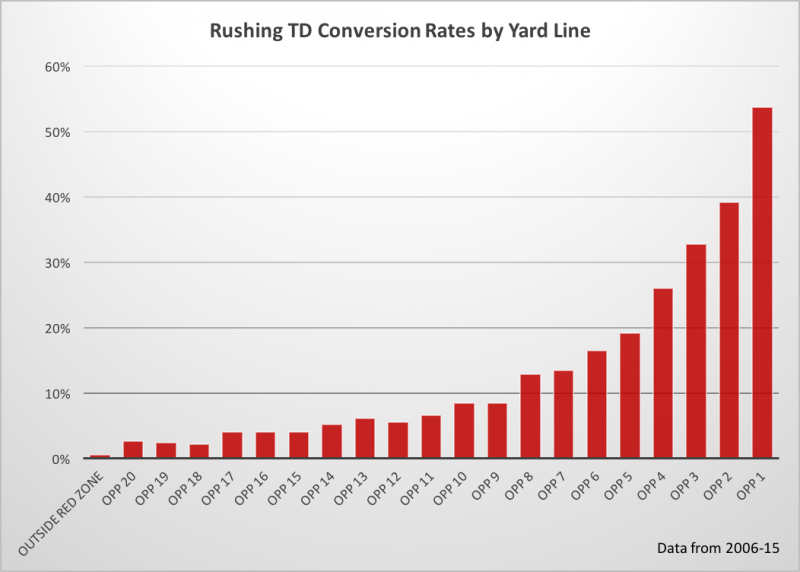 Make no mistake, goal line opportunities are unpredictable and rare: offenses average just over one attempt per game inside the 5-yard line and are held without a single attempt inside the 5-yard line in roughly a quarter of their games. However, even though you can’t predict exactly when (or if) goal-line opportunities will arise, you can, to some degree, predict which running back will be on the field when it does. Meanwhile, positive game script maximizes not only a running back's potential for carries, but also his potential for touchdowns; offenses ran the ball inside the 5-yard line 56 percent of the time when leading or tied in 2015, but just 48 percent of the time when trailing. Only 39 percent of all rushing touchdowns occurred when the offense was playing from behind. As expected, running backs produced the most DFS value when they were home favorites. However, the other splits were a bit counterintuitive. 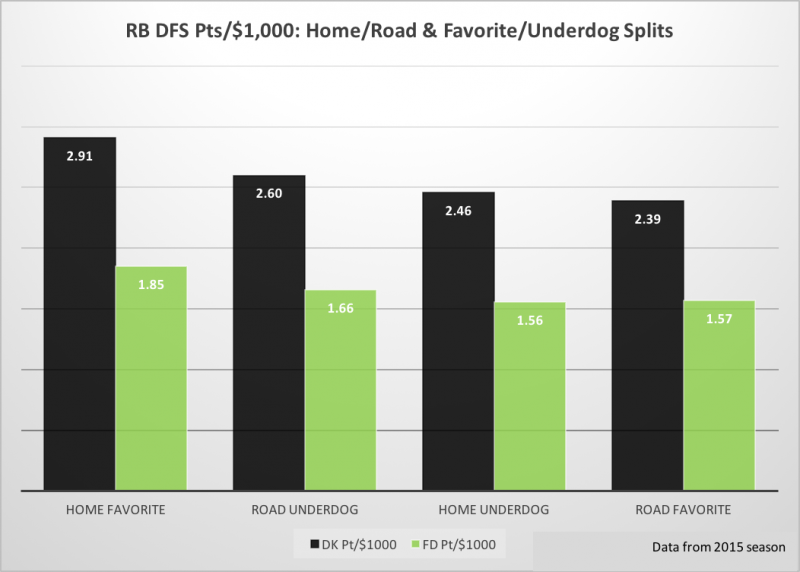 It appears both DraftKings and FanDuel underpriced running backs playing on a road underdog and overpriced running backs playing on a road favorite, which is something to keep in mind when you're searching for a low-owned play to set you apart in a large tournament. In any case, it's clear that selecting running backs playing on a home favorite provides the greatest edge. Since game script largely tells you most of what you need to know about a running back's matchup, I'd tend towards giving less weight to an opponent's fantasy points allowed at running back than at other positions. I wouldn't fade a good projected value solely because of a tough on-paper matchup (doing so would have resulted in fading Freeman in his aforementioned monster game, for example). Since the role and quality of running backs differs from team to team (especially in the receiving game, which continues to account for more and more of the average back's production), schedule-adjusted fantasy points allowed -- rather than the raw figures -- is the optimal metric to use here. Savvy NFL teams have begun to realize that most running backs are interchangeable, and one of the main reasons for that line of thought is that a running back's production is due in large part to his offensive line's blocking prowess. Injuries or other changes to a back's offensive line, particularly on the interior, can effect production. The same can be said for a defense's front seven. The success of running backs when their team is a favorite may have already made this evident, but I should point out that going against a weak pass defense can enhance the fantasy outlook for an offense's running game as well. 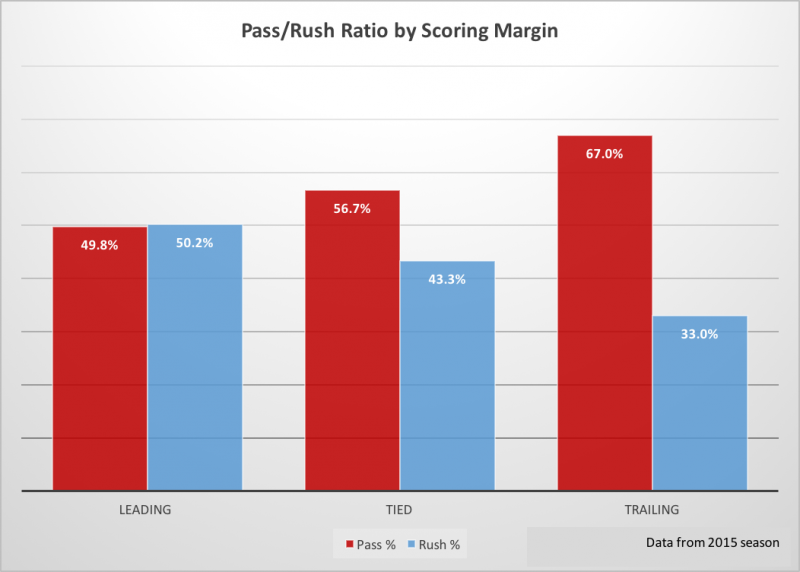 The threat of the pass usually means the defense will have to field more defensive backs and play softer fronts, which likely explains the increase in rushing efficiency for Vegas favorites. In the eight games C.J. Anderson played in 2015 where he was absent from the injury report, he averaged 13.0 DraftKings points, but in the seven games he played after appearing on the injury report, that figure fell to 6.2. Anderson's case is extreme, but injuries do have a tangible effect on running back performance, and there can be a difference between probable and questionable tags. Below is a comparison of running back performance when healthy to performance when playing through injuries overall, as well as their performance when playing through some of the more common injuries. Roughly a 10-percent decline in production can be expected when a running back plays through an injury. As you might expect, a questionable tag has a greater impact that a probable tag. Lower body injuries are particularly detrimental, although hamstring injuries only had a negative effect when accompanied by a questionable or doubtful tag. Minimizing busts is a priority in cash games, so you want to target three-down backs on Vegas favorites, preferably at home, whenever possible. You're essentially trying to maximize touches via positive game script, while at the same time selecting a back that can still produce in the receiving game if negative game script hinders his rushing production. We know touches provide a high floor, which makes cheap running backs that are taking over the starting role due to injury very valuable in DFS. Just think how crucial it was to roster cost-effective backs like Thomas Rawls, Jeremy Langford, and Charcandrick West when they were thrust into larger roles in 2015. A running back’s situation-dependent nature means you don’t have to pay up in GPPs. Of the 10 highest single-game DraftKings running back scores in 2015, the average salary was $5,130 and only three backs cost more than $5,500. Same story with the 10 highest FanDuel scores: the average salary was $6,590 and only two backs cost more than $6,700. The backfields in winning lineups generally combined a chalk play with a low owned play. You already know how important touches are -- especially cheap touches -- and fading all of the obvious value for the sole sake of going contrarian can often be counterproductive. Should you be putting a running back in the flex? The winners put a running back there 50 percent of the time, the most of any position. This may seem counterintuitive since wide receivers tend to have higher overall ceilings, but it all comes down to value -- it's often a lot easier to predict when a cheap running back will be valuable. Using a cheap running back in the flex can open up cap space to roster high-end stud receivers with gigantic upside. Total touches have a stronger correlation to running back fantasy points than any efficiency metric – emphasize volume over efficiency. Goal-line work and red zone work is essential -- chances are minimal that a running back will score outside of the red zone. Positive game script increases a running back’s odds of fantasy success – target Vegas favorites, especially at home. Running backs who get passing down work in addition to being their team's primary ballcarrier tend to have a higher floor because they won't be as negatively impacted by game script as backs who are often removed in passing situations. A cheap backup running back filling in for a starter is one of the most valuable types of players to target in DFS, and are viable in cash games. One chalk play at running back is still okay in a large tournament, but is best balanced out by a low-owned play. 4for4's DFS Subscription has site-specific lineup generators (now with floor/ceiling projections), stack value reports, tons of in-depth content and more. Sign up here!